Last month, the agriculture ministry informed Parliament that 2,806 farmers committed suicide in 2015 due to “agrarian reasons". The data further showed that the highest number of suicides were recorded in Maharashtra (1,841), followed by Punjab (449), Telangana (342), Karnataka (107) and Andhra Pradesh (58), among others. What is common to these states is that they have been the epicentre of the ongoing rural distress, triggered by two back-to-back failures of the Indian monsoon together with a collapse in global commodity prices, including agricultural commodities. However, there is a deeper connection between the farmers residing in what is rapidly emerging as the farmer suicide belt in the country. It is that all of them share, surprisingly may be, a growing risk appetite—something which has led them to reorganize their crop mix away from traditional offerings. While this promises dramatic increase in return, it includes unhedged downside risks, like what has transpired in the rural economy in the last few years. This behaviour of the Indian farmer is in complete contrast to their treatment in public policy—which assumes the farmer to be risk-averse and in constant need of hand-holding, be it farm support prices, input subsidies or farm loan waivers. It is exactly this perception of a farmer as a “dumb peasant" (as defined in economic theory) in public policy, which lies at the core of this agrarian tragedy. Take, for instance, cotton farming, one of the segments most afflicted by farmer suicides. Their response conforms in no way to the “dumb peasant" perception; they behaved like perfectly rational human beings, willing to take advantage of free market behaviour. The introduction of high-yielding varieties of cotton dramatically increased the yield per hectare (ha), rising almost two-and-a-half times from 190kg per ha in 2000-01 to 491kg per ha in 2011-12. The temptation of a sharp spurt in returns was something farmers simply could not resist. Consequently, the area under cotton cultivation grew a little over 40% from 8.53 million ha in 2000-01 to 12.18 million ha in 2011-12. Similarly, the Indian farmer has taken to horticulture farming. As a result, for the third straight year, production of fruit and vegetables surpassed that of foodgrain in 2014-15 (by more than 30 million tonnes). However, when rural distress struck, farmers were stuck with a mounting debt burden—the core reason that prompted farmer suicides. A must-read series, India’s Fractured Farms, published by Mint last year, succinctly explained the structural factors underlying rural distress, including the inability to underwrite the emerging risks of farming using market-based instruments like insurance. 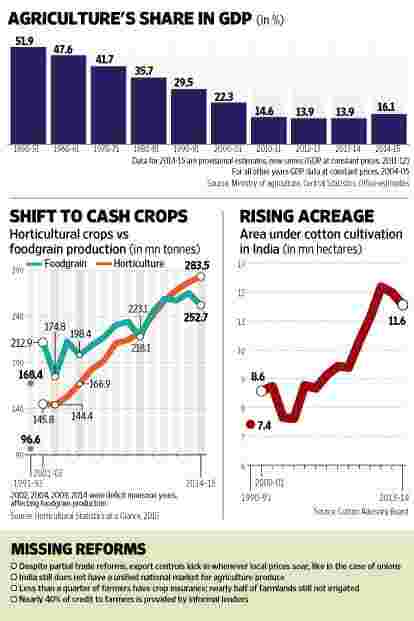 It is baffling that public policy so far has missed de-risking modern Indian agriculture. For clearly, if a farmer is smart enough to take up risky investments purely on the principle of profits, he will be rational to take out hedges against downside risks if they are made available. While the past is not inspiring, it is indeed welcome that public policy on farming turned a corner this January after the National Democratic Alliance launched a revamped crop insurance scheme. At first glance, the scheme, christened Pradhan Mantri Fasal Bima Yojana, looks mostly like a reworking of the risk cover already in place; actually, it is much more. Not only has it reduced the premium payable by a farmer—1.5% on rabi crops, 2% on kharif crops and 5% on commercial/horticultural crops—it has also freed commercial and horticulture crops from risk assessment on an actuarial basis, which at times would push up the premium to 25% (making it unaffordable for most farmers). Further, since it proposes to use the intersection of the mobile phone, bank account and possibly Aadhaar, it will ensure direct transfer of compensation—an additional spin-off being the boost it is likely to give to the cashless economy. It may be only the first step, but in the right direction. Together with the emphasis on rural road and telecom connectivity, the integration of rural India into the national economy will only accelerate. It certainly won’t happen overnight; structural change is never easy. But it at least begins to bury the "dumb peasant" theory in Indian public policy. Next week: Indian family business houses—Navigating through turbulence.